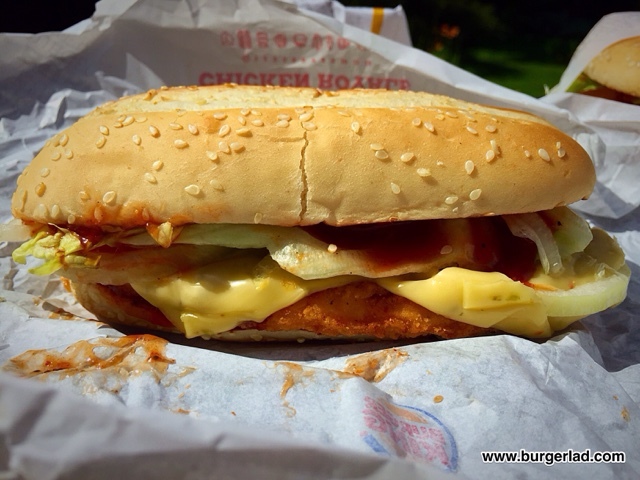 Burger King Summer Barbecue 2015 - Price, Review, Calories & More! See our original news story below for descriptions of the burgers. 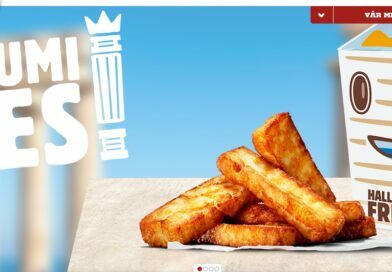 Burger King has a new promotion out in the UK, with the news having been exclusively broken by Burger Lad® earlier today. 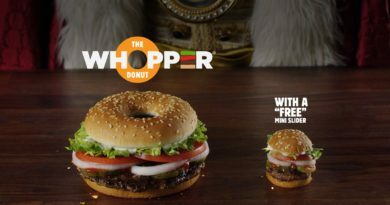 This was no thanks to Burger King, who seemingly started the promotion with no advance warning. As such, it meant an unplanned dash to my local BK branch. I’m not fond of mad dashes, preferring to have things planned out with naval precision. So, anyway, after receiving the beacon from Burger Lad®, I gathered up Little Miss Dauntless, who was happily drawing pretty pictures on the wallpaper, and left the house so quickly, my valet didn’t even have time to suggest a hat. And en route to BK, everybody else seemed to be driving Miss Daisy, so the morning was increasingly frustrating. Anyway, back to the burgers, and when I saw Burger Lad’s tweet with the four items pictured, I said to him that they all look good and I’d have trouble deciding. As I drove to BK I was increasingly erring toward the Jerk Chicken Tendercrisp. I’ve had some amazing Jerk lately, not least at Boom Burger and Love From The Streets. I wasn’t necessarily expecting that level of outstanding flavour on a fast food burger, but my hopes were high. And then they were dashed…. When I arrived, clearly I was the very first person to order anything from the new promotion, so there was quite a bit of communication issues to begin with. Then, once we did establish what I wanted, the bombshell dropped. “We have no Tendercrisps”. Apparently, they’d sold more than expected the day before and run out. On the day of a new promo, no less! And the next delivery was tomorrow. 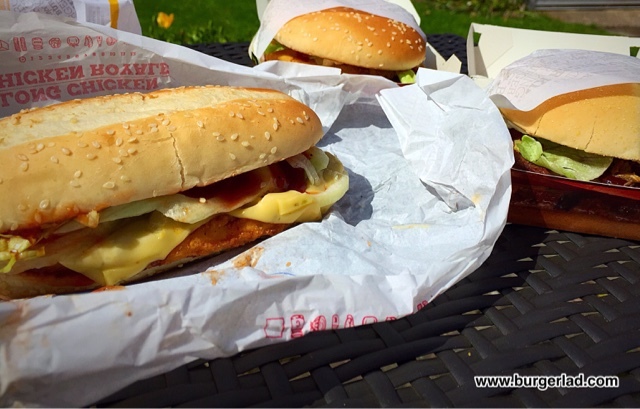 While I ordered the other items – Spicy BBQ Steakhouse, Summer BBQ Whopper and Nacho Cheese Bites, I suddenly had some inspiration. I asked for the Jerk Chicken Tendercrisp to be made with a Royale patty. I know it’s oval and would stick out, but I don’t mind. Just make it otherwise the same as the promo. Clever idea, or so I thought, but this unfortunately was not the end of my woes today. Anyway, I drove back up the driveway, one of the gardeners waved and I blanked him, so focussed I was on getting on with my review before my burgers got cold. I set them all out, got some nice photos in the sunshine – perfect day for the start of a summer promotion – and set about eating. The first thing I noticed was that there was no special box. 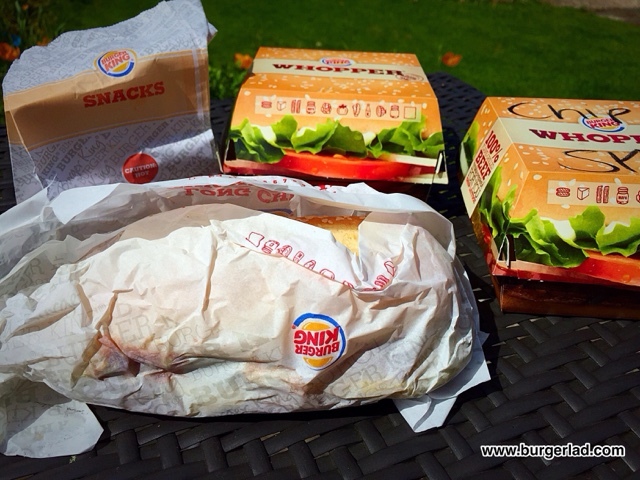 Burger King had some striking promo boxes for the Route 66 one recently, but for this one I had two ordinary Whopper boxes with some handwritten scribbles on top, and an ordinary Royale wrap for the other. The Nacho bites came in a small paper bag uninspiringly labelled “Snacks”. This is essentially a bacon and cheese Steakhouse, with lettuce and tomato, and what looked like crispy onions or pieces of nacho on top. I couldn’t tell, either by looking at it, or by tasting it, and the description didn’t clarify. The “spicy” comes from the use of pepperjack cheese and a chipotle BBQ sauce which will apparently change my life. Well, it didn’t. My life is much the same as it was before, and even the burger felt familiar. Now, with the Steakhouse, that’s arguably a good thing. The Steakhouse is a good burger. And BK’s BBQ sauce is also highly enjoyable. It’s most prominent, I think, on the simple but excellent rodeo burger. But when it’s time for a limited promotion, I don’t necessarily want familiar. I want something different. The picture and description certainly gave that impression, and the special cheese and sauce meant this one would have some degree of kick to it. But nothing, nada, rien du tout. Either this branch had used ordinary cheese and/or ordinary BBQ sauce, but this tasted very much like an ordinary Steakhouse. The tomatoes were quite prominent, as was the mayo. It may be that the coolness of the mayo negated the spiciness of the chipotle, I don’t know. But if that’s the case, then there really oughtn’t to be mayo on this one. 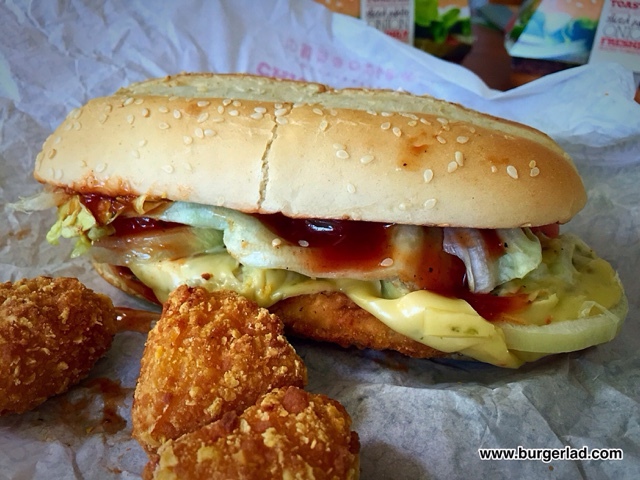 The bun was fine, BK’s usual that is quite soft and crumbly. And the patty was good – can’t really go wrong with that very distinctive flavour and taste that comes from the flame grilling. The bacon was a little crispy, as advertised, but I’m not sure I would have even noticed that had it not been for reading the blurb beforehand. But in terms of the spicy flavour that was supposed to set this apart, there was just nothing. 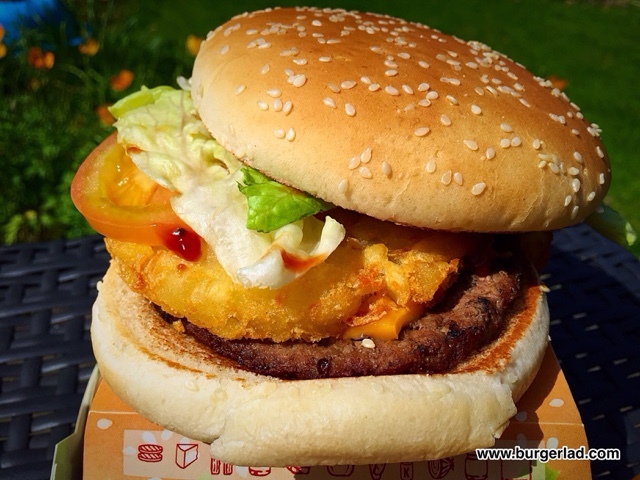 As a decent summer BBQ burger it’s OK, but as a special limited offer, I was disappointed. Perhaps I’d have more luck with the next one. Well, this was a big heavy burger. The cardboard box even buckled under the weight of it. 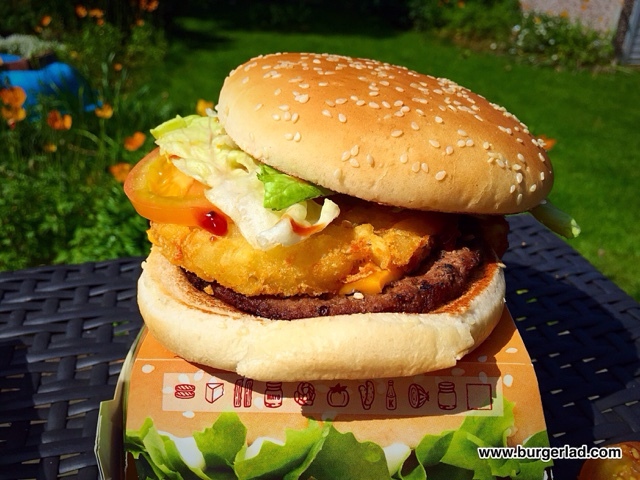 At the time of writing, this hasn’t made it onto BK’s UK website, but the defining feature of this is clearly the hefty potato rosti, in addition to the already substantial Whopper patty. As the name suggests, this one also has BBQ sauce, a dark beer variation apparently, but I really didn’t get anything like that, other than the usual BBQ flavour. The crunchiness also comes from the rosti, which was actually rather nice, if perhaps a bit plain in flavour. The large pieces of onion on this not only added a further bit of crunch, but also a nice bite. Patty and bun were as usual at BK. 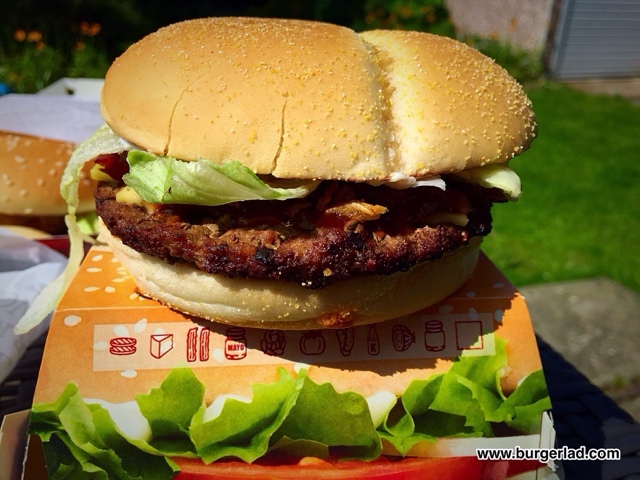 The whopper patty is of course a bit larger, but still has that classic flame taste and smell. No mayo on this one, which was good, and allowed the BBQ flavour to come through more. That’s probably what you want if it’s a summer BBQ rather than a summer Mayo promotion. It felt substantially heavier in my hands, compared to the Steakhouse, but yet didn’t taste particularly different. If I’d added Mayo and removed the potato, I might not have been able to tell them apart in a blind taste test (apart from the feel of the size). 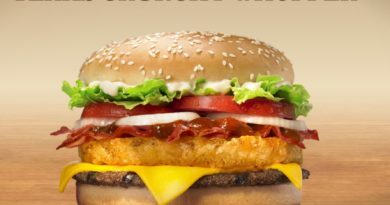 There’s been a limited promo item before from BK, with a potato rosti in the middle. I can’t remember which one, but it wasn’t that long ago. I’m sure Burger Lad® will be able to insert an edit explaining which one it was (Texas Crunchy Whopper Admiral)! But for that reason it didn’t feel especially new either. I know it’s not exactly the same as the one I’m thinking about, but by this point I was starting to feel that the essence of summer, as borne out in this promotion, was basically just adding BBQ sauce to things. I’m really sorry that I didn’t enjoy these burgers as much as I’d hoped. Well, it does happen sometimes, and hopefully the autumn promotion will firstly give us more advance notification, and be a little more daring. If you recall from the beginning of this review, this was the Tendercrisp without a Tendercrisp. I’d asked for it to be made up properly, just using a Royale instead of a Tendercrisp chicken, which they didn’t have. Well it wasn’t. Not even close. I did check my receipt and my bag before leaving. The receipt stated “Royale cheese” and in the bag was clearly a Royale with cheese, oval bun and all. Nothing at all like the promotional item I wanted. This was the icing on the cake, because the jerk flavour was the thing I’d been looking forward to most of all in this whole promotion. It’s bad enough that they didn’t have any Tendercrisps, but it was made infinitely worse by simply building a regular Royale for me. I’m not going to take up your time by talking about a Royale with Cheese that’s supposed to be a BBQ Jerk Tendercrisp, but suffice it to say, crushingly disappointing. But hey, let’s end on a positive note. In my view, this time round, the star of the promotion is the “snack” sidekick. These little critters were tasty. You’ll see there are only three in the photos, and that’s because I ate one in the car! Golden crispy on the outside, and warm with that characteristic nacho cheese flavour on the inside, these made me feel good again. At basically 50p each, considering their size, I felt they were a bit over-priced, but given that I’d finally got something out of this promotion that I really enjoyed, I wasn’t complaining. These bites were exactly as advertised, and didn’t have any BBQ sauce in or on them. I’m not sure how it reflects on the Summer BBQ promotion that the best item is actually the side-dish, but they were. 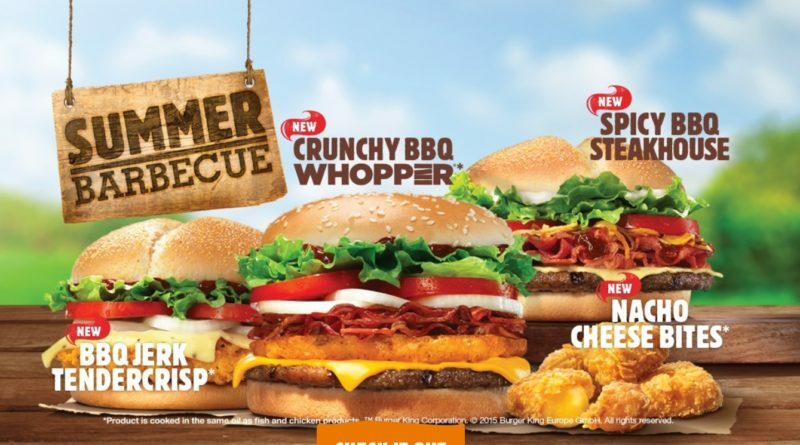 Burger King Summer Barbecue promotion launched! 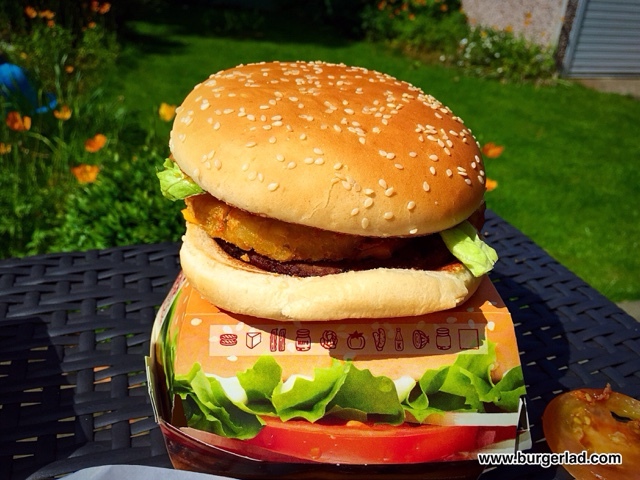 BREAKING: Burger King UK have launched their new promotion with the Summer Barbecue range. 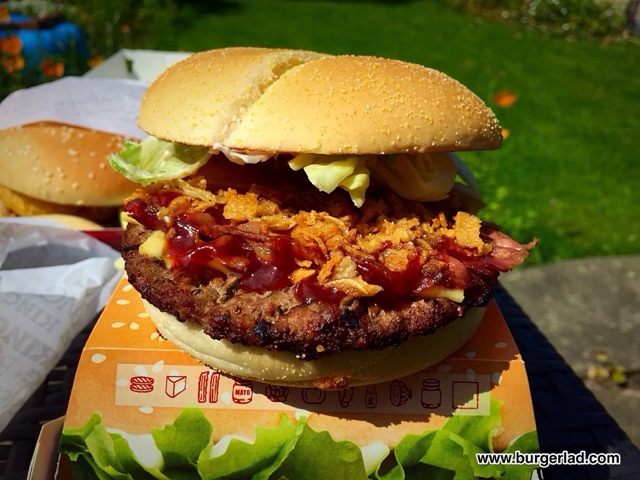 Up first is the Crunchy BBQ Whopper – which is made up of a flame-grilled beef patty, bacon and salad items but enhanced with a potato rosti and moistened with a dark beer BBQ sauce. 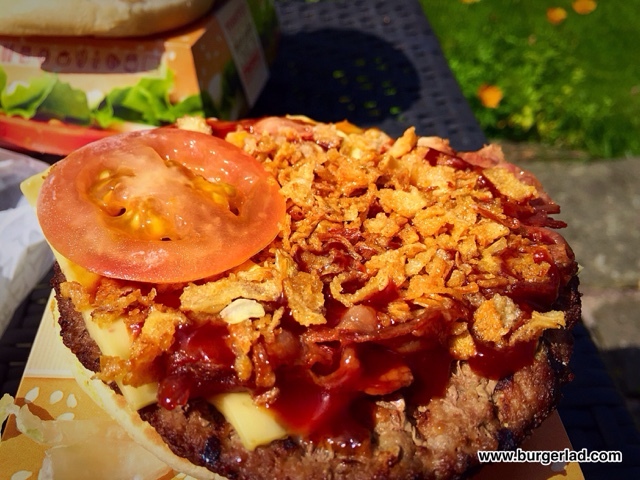 An interesting sounding promotional burger is the Spicy BBQ Steakhouse which contains Chipotle BBQ sauce, crispy bacon and pepperjack cheese. Finally we have another promosing item with the BBQ Jerk Tendercrisp – this has 100% chicken breast and is served with BBQ Jerk sauce and pepperjack cheese. All burgers have the RRP of £4.29 with a meal option costing £5.79. They are available from Wednesday 10th June and will run until Tuesday 1st September. Also as part of the Summer BBQ range will be the Nacho Cheese Bites at £1.49 for 4 pieces and £2.39 for 6. Frozen beverages in the promotion consist of Frozen Lemon Limeade, Frozen Cherry Berry Lemonade and Pina Colada Smoothie. BK Fusions get a new addition with the Toffee Crisp Fusion. Shame that! I saw these the other day and thought they looked good. 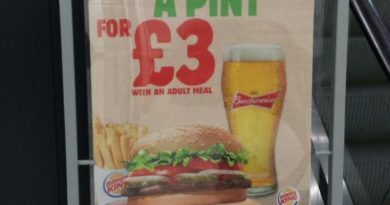 I hadn't yet passed a BK to try any, looks like I'll keep driving now when I do pass one! it should never be allowed!